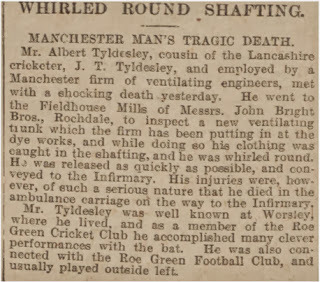 Mr. Albert Tyldesley, cousin of the Lancashire cricketer, J. T. Tyldesley, and employed by a Manchester firm of ventilating engineers, met with a shocking death yesterday. He went to Fieldhouse Mills of Messrs. John Bright Bros., Rochdale, to inspect a new ventilating trunk which the firm has been putting in at the dye works, and while doing so his clothing was caught in the shafting, and he was whirled round. He was released as quickly as possible, and conveyed to the Infirmary. His injuries were, however, of such a serious nature that he died in the ambulance carriage on the way to the Infirmary. 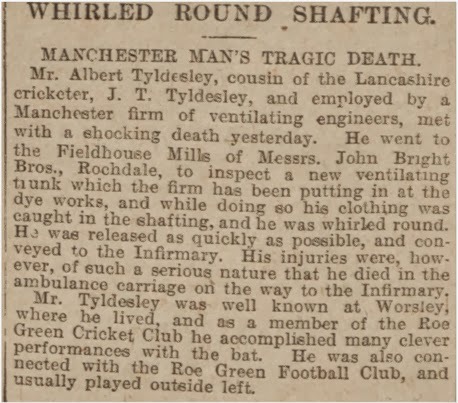 Mr Tyldesley was well known at Worsley, where he lived, and as a member of the Roe Green Cricket Club he accomplished many clever performances with the bat. He was also connected with the Roe Green Football Club, and usually played outside left.